Last week, I came out as a redhead. That’s not to say I don’t enjoy and occasional white wine. Sometimes the meal—or the mood—calls for it. I like to drink a sweeter white wine when I’m eating spicy food, such as Szechuan or Thai. If I’m hanging out and sipping wine on a hot summer day, I might opt for something fruity and dry. 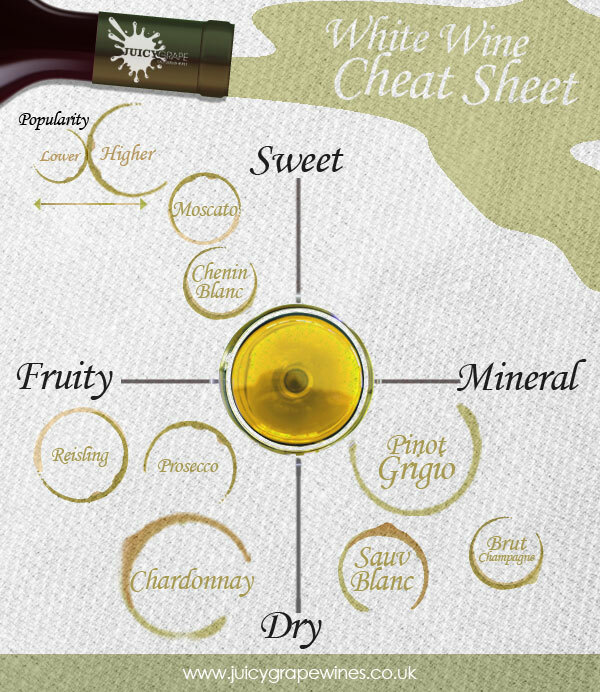 This cheat sheet gives a quick breakdown of the flavor profile of some popular white wine varieties. What’s in your glass these days? Let me know in the comments! Summertime, the living is easy—and hot. Some nights, the mere thought of cranking up the stove or oven can make you sweat. No worries! You only have to fire up you telephone (or computer) to get a pizza delivered to your doorstep. But what vino should you pair with your pizza pie-o? Indian Wine List comes to the rescue with this infographic that shows which wine goes with your topping of choice. What do you like to drink with your pizza? Let me know in the comments below. This infographic is chock-full of information for wine newbie. Use this handy chart to learn basics — such as how to read a label, which glass to use, and what temperature to serve you favorite wine.